With all the hype around Snapchat recently and online sellers wondering if the hype is worth incorporating Snapchat into their social media marketing programs, this data point may help your decision. There is no doubt Facebook is still the king of all social media with 1.87 billion users and Snapchat is right now hovering around the 300 million mark with about half being active on a daily basis. Because it is a mobile first social media service and a newer entrant into the space, Snapchat’s users trend younger, typically between 13 and 35. Younger audiences engage newer services more quickly and as social media services gain traction and come to age, the user base shifts older. Snapchat is a bit at these crossroads now as its exposure is driving new older users to the service. But that doesn’t mean it should be ignored if you are in the businesses of selling products that serve a younger age group (under 35). As a matter of fact, we suggest this is a great time to expand your social media marketing to Snapchat and here is a metric that should convince you. Surprised? We were a bit as well. 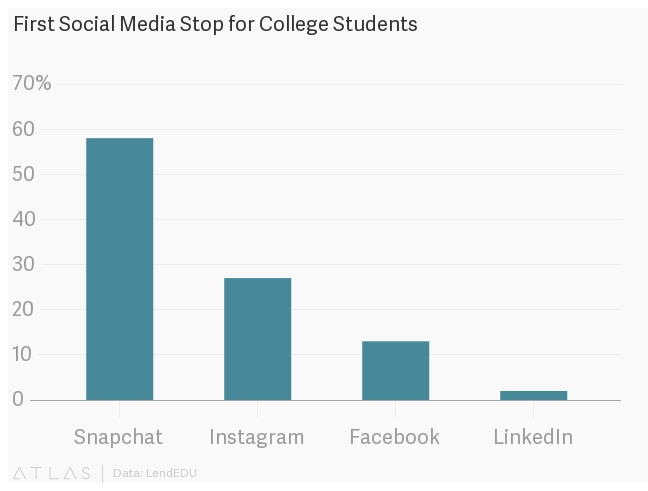 Yes it is a very narrow metric, but it shows the power of Snapchat right now with a younger demographic. Snapchat’s share in this “First social media Stop” metric is 58%, Instagram (a bit of youth movement darling a few years back) at 27%, Facebook (the grand daddy) at 13%, and LinkedIn (Job Search?) at 2%. We do wonder about the absence of Twitter in this study, has it really fallen that much off the face of the earth for young adults to not even ask the question? Regardless, the results of this study cannot be overlooked by any SMB that is selling to a younger audience. It clearly identifies Snapchat as a major player for target marketing.